Vietnam will unceasingly consolidate and develop the fraternal solidarity and comprehensive cooperation with Cuba as well as the mutual trust between the two Parties, States and peoples. Deputy Prime Minister Nguyen Xuan Phuc made the affirmation at a reception for visiting Vice President of the Cuban Council of Ministers Marino Murillo Jorge in Hanoi on October 8. 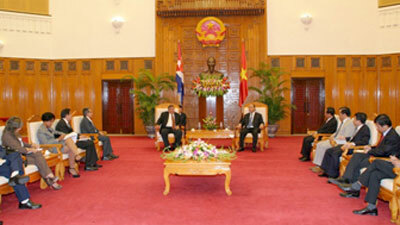 Phuc said he is pleased with great achievements the Cuban people have made over the past time, adding that the Vietnamese Government will join Cuban efforts in effectively implementing agreements reached by the two countries’ leaders. He suggested that the two governments work closely to seek new mechanisms and measures suitable to both countries’ conditions in order to further bilateral cooperation. Vietnam and Cuba should strengthen coordination and mutual support at regional and international forums to which they are members, he said. Marino affirmed that the Cuban Party, State and people always wish to strengthen and consolidate multifaceted cooperation with Vietnam as well as learn renewal and national development experience from the country. He expressed his hope that Vietnam will cooperate with and support Cuba in agricultural development, especially in the cultivation of food and industrial crops. Vietnam’s representative has highlighted the ASEAN’s central role in coordinating regional maritime cooperation, especially in working out the agenda and defining the bloc’s priority fields of cooperation, at the recent third ASEAN Maritime Forum (AMF) and the first Expanded AMF (EAMF) in Manila, the Philippines. Addressing the events, Deputy Foreign Minister Pham Quang Vinh presented Vietnam’s stance on strengthening regional maritime links on the basis of international law and the United Nations Convention on the Law of the Sea (UNCLOS), for the interests of each country and the entire region. Vinh stressed the need to build trust and boost cooperation to ensure peace, stability, security and maritime safety, as well as the solving of disputes by peaceful measures on the basis of international law, the 1982 UNCLOS, and regional agreements like the Treaty of Amity and Cooperation (TAC) in the Southeast Asia, the Declaration of Code of Conducts of Parties in the East Sea (DOC) and soon achieving the Code of Conduct in the East Sea (COC). He also highlighted the ASEAN’s central role in coordinating regional maritime cooperation, especially in working out the agenda and defining the bloc’s priority fields of cooperation. The Deputy FM underscored the active implementation of ASEAN’s initiatives on cooperation in marine environment, coping with natural disasters and accidents at sea, especially helping seaman and boats in distress. During the three-day AMF and first Expanded AMF from Oct. 3-5, ASEAN members and East Asian partners agreed to increase cooperation and build trust, in line with ensuring peace, stability, security and maritime safety to create a favourable environment for maritime cooperation. They also emphasised the respect of international law, the 1982 UNCLOS, TAC, DOC, the six-point Principles on the East Sea and the settlement of disputes through peaceful negotiations. A master plan on activities for the rest of this year to boost cooperation between Vietnam’s northern border province of Lao Cai and China's southern border Yunnan province has been finalised, according to local authorities. Under the plan, the two sides will joint hands to organise the fourth international forum on the development of the Red River basin and field trips to localities of the two provinces to further tap future tourism potential. Another important event will be the opening ceremony of the Kim Thanh international border gate No. 2 on November 8. In addition, the Vietnam-China Trade Fair 2012 will be held in Yunnan province from November 8-12.